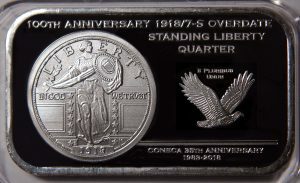 Thanks to the generosity of CONECA member, Bill Fivaz, over 35 slide show presentations on subjects such grading, counterfeit detection, the minting process and error and variety coins are available for loan at “no charge” to club members who want to show them to groups. The following slide series are available on a “No Charge” basis to all recognized numismatic organizations for educational purposes. They are copyrighted and no series or portion thereof may be reproduced in any manner without specific permission of the author. 1 Indicate the particular series you would like to borrow by letter/number designation and name. 2 Advise for what purpose they are being requested (name of club, etc. ), and the date they will be used. 3 An estimate of the number of people that will be viewing the program will be helpful. 4 Please include $6 per set with your request which will cover postage, necessary insurance, handling, etc. In the event an individual or group wishes to purchase slides (S) or prints (P) of any series so marked (some are available only in slides), the cost is indicated after each in parenthesis. This price includes postage, insurance and handling. NOTE: Please be aware that some slide series (The Counterfeit Detection Series, for example), title slides are used in the slide program but are omitted as unnecessary in the set of prints. For this reason, there are a few less prints (photos) in some series. Also, it helps tremendously if you order the series you want for your program about 15 days prior to the viewing. In this manner it will afford you the time to preview the slides prior to the meeting and coordinate them with the accompanying text (where one is involved). It is also important that you return the series as soon as possible after the showing as other clubs may wish to borrow the same set. Thanks very much, and I hope you can use something from the following list. indicating the first point of wear) These slides were taken with the ANA Grading Guide and/or Photograde as a reference. The text from either of these books should be read as the particular grades shown (preferably the current ANA Grading Guide as it contains all the Mint State grades). Set A. FLYING EAGLE 1c: 24 slides showing obverse and reverse of grades from MS-65 to About Good. (Slides, if purchased – $30 / set). widely collected areas of Morgan Varieties. slide sets are available as a set for $125. 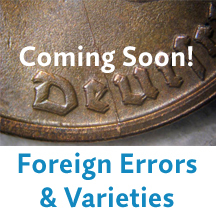 * Skips in sequential order are due to “missing” sections not related to the error-variety hobby not being included on this list. 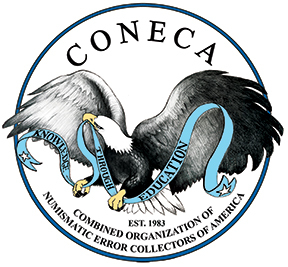 See The CONECA Handbook for the more comprehensive listing which including other subjects. Hopefully more series will be added in the future as well as additions to the existing sets where applicable. I am always open to suggestions other series that you’d like to see. If I am able to obtain the necessary specimens to photograph and there is enough demand, I’ll undertake such a project. Also, specialty work is available for individuals or clubs at reduced rates if a specific coin on series is wanted. On all orders, please bear in mind that in some cases additional sets must be made up which m,may take up to 3 weeks. This concerns sets that are purchased. To order any series or to obtain any set on loan for your club program, please refer back to page the instructions at the top of this page. Please note: This list was originally published in May of 1987. Due to possible changes in postal rates since that time, or additions to the sets since that time – prices for return postage on sets “on loan” and sell prices are subject to change. It is best to check on the exact prices at the time of your order in the event that slight price changes are applicable.